High school coaches, administrators and athletes. College coaches from all levels and from across the northeast. In the summer of 2012, the NYSSWA converted from a subscription/newsletter model to an entirely online presence relying upon ad revenue and contributions via PayPal. What does the NYSSWA do? The biggest undertaking is weekly rankings and season-ending all-state selections in a variety of sports, formerly delivered in the eight-page weekly newsletter. The NYSSWA also has been known to play another role -- the conscience for prep sports in New York. Beholden to no one because of its independent status and long reign as the definitive source of information, the NYSSWA has taken strong, influential stances over the years. Longtime newsletter editor Neil Kerr in Syracuse was long a proponent of adding state tournaments in several major sports. When the New York State Public High School Athletic Association stopped inviting New York City's public and Catholic schools to compete at season-ending championships in the 1990s, NYSSWA members from across the state were quick to challenge the logic and helped pressure the NYSPHSAA to reconsider and then reverse itself. In October 1998, several NYSSWA members met with NYSPHSAA officials to discuss ways to speed up the flow of results and information from state championship events. With The Associated Press having abandoned coverage of N.Y. high school sports, this alliance was a valuable step toward cooperation in subsequent years. The NYSPHSAA has steadily improved the flow of news to the media, resulting in more information being available to the public. Several NYSSWA members serve on the media advisory committee of the NYSPHSAA. 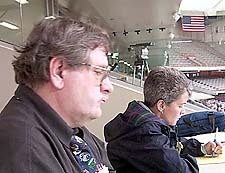 Former Syracuse Post-Standard reporter Neil Kerr (pictured, left), regarded by many as the dean of scholastic sports writers in New York, edited the weekly newsletter from his home in Syracuse and remains the organization's editor and treasurer. The president is John Moriello, who covered high schools for Rochester's Democrat and Chronicle in the late 1980s, helped launch DemocrtandChronicle.com and now works for FoxSports.com. The vice presidents are Kevin Stevens of the Binghamton Press & Sun-Bulletin and Mary Jo Monnin (pictured, right) of The Buffalo News, both veterans of the scholastic sports scene in New York. Founded in 1967, the New York State Sportswriters Association has long been regarded as an authoritative voice and the leading source of information about scholastic athletics. Begun by sportswriters Larry Serrell of the Schenectady Gazette and Chuck Korbar of the Buffalo Evening News, NYSSWA membership grew from a mere 12 in 1967 to 246 in 1971. Larry died in 1983 and Chuck passed away in 1998, but they built the foundation of an organization that included hudreds of reporters, coaches, administrators and assorted fanatics who received 50 annual issues of the newsletter. Today, prep writers and editors from virtually every newspaper and many other media outlets in New York -- many of whom contribute countless hours compiling rankings information and statistics -- supply information that appears on this website. Send e-mails to John Moriello and Neil Kerr.